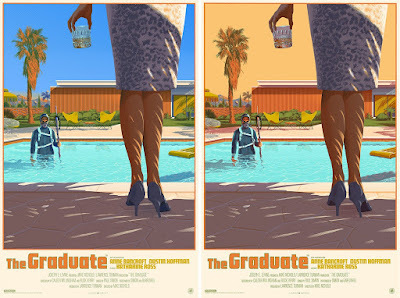 Last Friday, Nautilus Art Prints released a killer new The Graduate movie poster by acclaimed artist Laurent Durieux! For this officially licensed poster, Laurent takes us back to a key moment in the 1967 film directed by Mike Nichols and starring Dutin Hoffman and Anne Bancroft. The Blot especially loves the retro sunny California vibe this wonder image by Durieux evokes. The Graduate by Laurent Durieux is a 24”x36” signed and numbered 12 color screen print. The Regular Edition is limited to 200 pieces and retails for $65, while the Variant is limited to 67 pieces and retails for $95. Sadly both versions are now sold out at the Nautilus Art Prints online store.